The Hong Kong Airport Express is the direct rail link from Hong Kong International Airport into the city and one of the most convenient ways to transfer to the several areas in Hong Kong. The trains depart every 12 minutes and at 130 km/hr will make the 30 km ride to Central, the last stop in the line, in 24 minutes. Using the Hong Kong Express is now easier with the new QR Code Mobile Pass which you can buy online and which enables you to go from the plane straight to the access gates without the need of redeeming tickets or vouchers as before. The Hong Kong Express is part of the Mass Transit Railway (MTR) system in Hong Kong. The Airport Express line runs parallel to the MTR Lantau Line but is the only line that makes it all the way to the Airport Terminal. 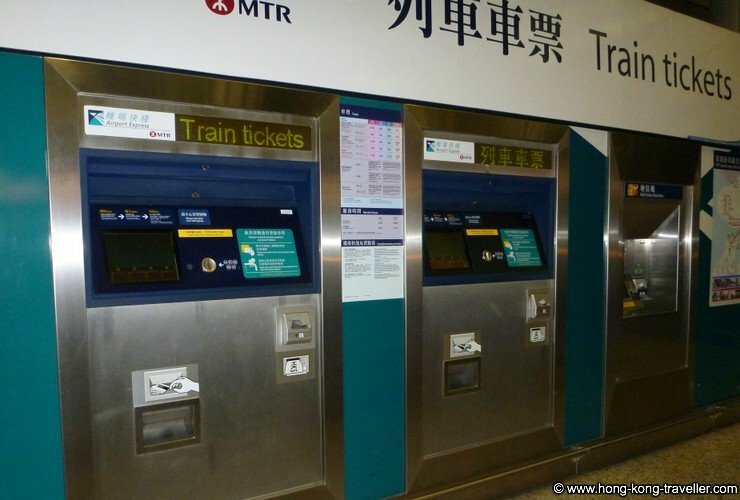 There are five stations in the Airport Express line, the Teal colored line in the MTR maps: the Airport Station, the Asia-World Expo Station where the line ends, and three Stations which most travellers are likely to use to get into the city: Tsing Yi, Kowloon and Hong Kong in Central. Once you arrive at your Station, there are free shuttle buses with stops at the major hotels, as well as MTR stations, ferry and rail terminals. 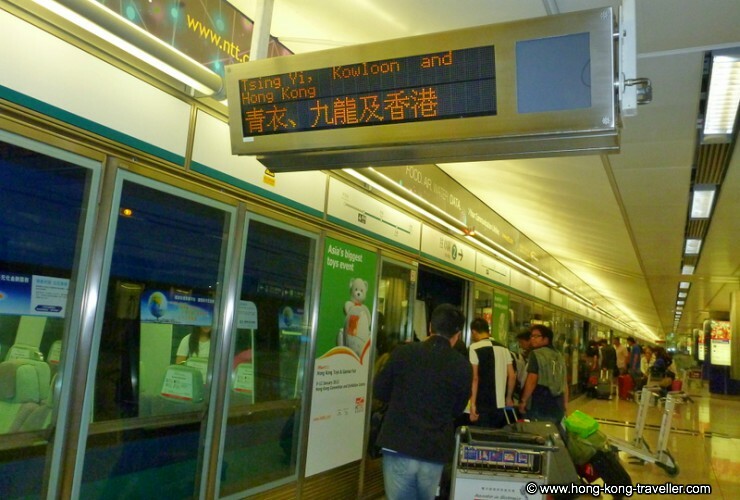 Riding the Hong Kong Airport Express from the city to the Airport is also convenient. There is a free check-in service at the in-town stations offered for passengers. This is extremely convenient when you have a late flight, it allows you to check your luggage in the city and you can spend the day without having to carry your bags around. 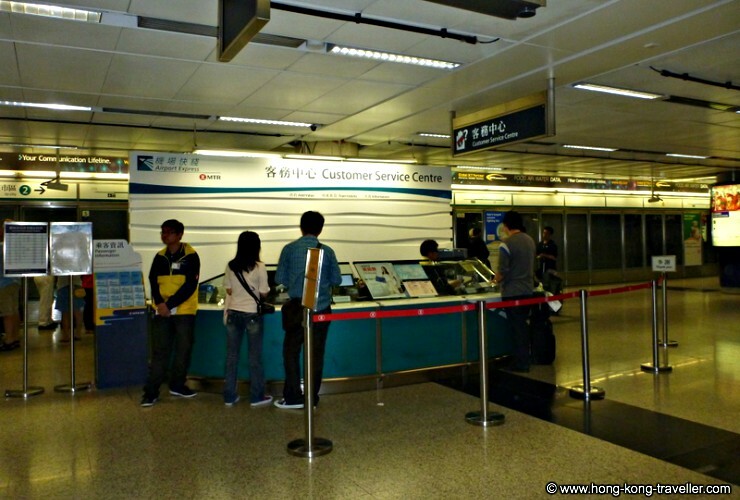 About Hong Kong Express Stations, which one to choose? Airport Express Shuttles, which one to take? At Which Hong Kong Express Station Should I Get Off? 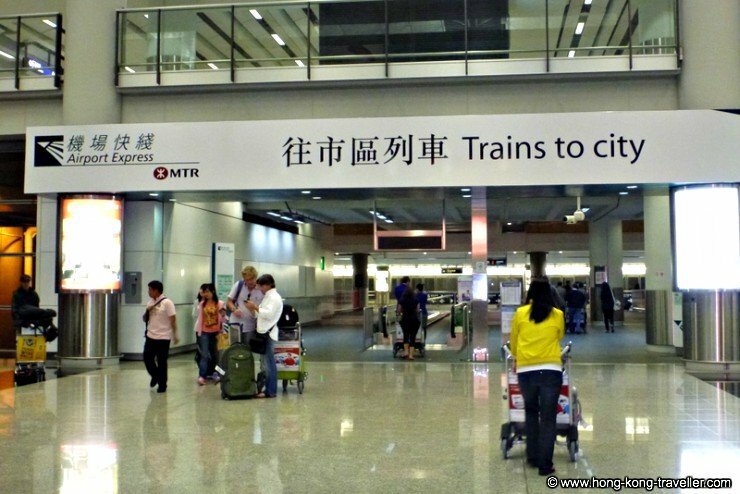 Airport Terminal: at the Arrivals Hall just follow the "Trains to City" huge signs, you can't miss it! The Asia World Station serves the Asia World Expo site, one of Hong Kong's Convention and Exhibition Centers, a venue for Trade Fairs, Concerts, and all kinds of events. Tsing Yi: this station is convenient if you are staying in the New Territories. Connects to the vast MTR network via the Tung Chung (Lantau) line plus is a major hub for buses. Kowloon: for destinations in the lower Kowloon Peninsula i.e. Tsim Sha Tsui, TST East, West Kowloon, Yaumatei, Mongkok, New Kowloon. Central: for all Hong Kong Island locations i.e. 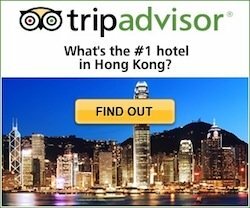 Central, Sheung Wan, Wanchai, Causeway Bay, North Point Island South locations. 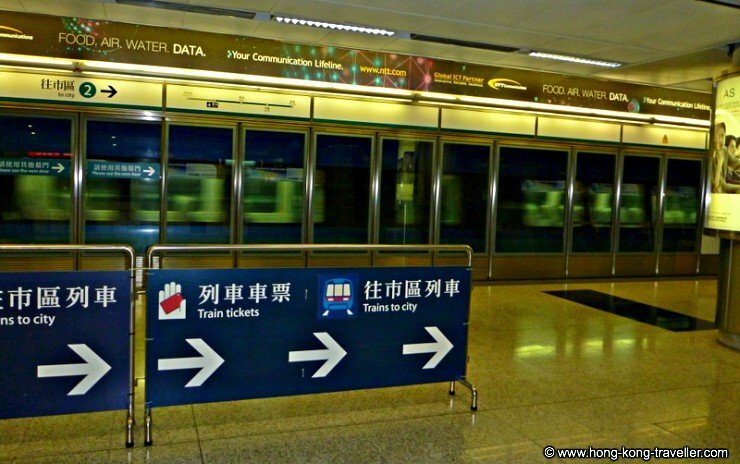 Signs for Trains to the City are clearly marked: "TsingYi, Kowloon, Hong Kong"
From the Central and Kowloon stations, there are free shuttle buses that take you to the hotels around their respective areas as well as selected MTR and rail stations. See below for which free shuttle bus to take. There are no concessions (discounts) for seniors over 65. The Adult fare applies. 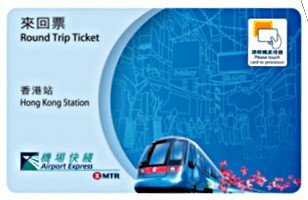 There is no round-trip discount for Adults paying with the Octopus Card, as the transaction will be counted as two single journeys when you take the trip. Check the Airport Express Website for latest info and fares to AsiaWorld-Expo. If buying the tickets at the airport, you can buy them at the Customer Center at the Arrivals area. You can also buy Octopus Cards here. Or buy your tickets from the vending machines throughout the airport. You can use your credit card to pay for Airport Express Tickets but not for Octopus Cards. Octopus Cards and top up balances are cash only. When you purchase online you print a voucher to be redeemed at the Service Counter at the airport. There is now also an option to receive a mobile QR Code which saves you the need of stopping at the counter to redeem the tickets. This is an excellent and convenient option that gives you access to the Airport Express, the MTR and the Ngong Ping Cable Car (optional). Passes can be bought online in advance and redeemed at the airport as you arrive, saving you precious time in individual ticket lines, money changing, etc. You can save big by buying your Airport Express tickets at Klook.com, Asia's largest in-destination service booking platform. You can book now and get your eticket instantly, there is no need to redeem the ticket at the counter, simply present Klook's QR-code enabled Mobile Pass and access the gates directly. There is no gate or turnstile to check for tickets, in fact, you don't need a ticket to get on the trains but you will need one to get out of the Station once you arrive. Once on board, relax and enjoy the (short) ride. There is free WiFi and free charging stations for phones and laptops in cars 1 and 7. 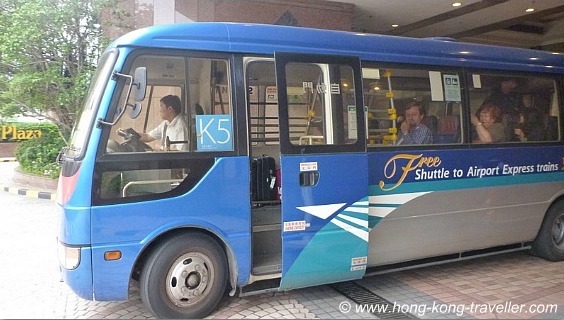 The Kowloon and Hong Kong Stations have free shuttles in 7 different routes, with stops at major hotels, main MTR stations, ferry and rail terminals to get you closer to your end destination. Which Free Airport Express Shuttle should I take? The following hotels are served by the Hong Kong Airport Express Free Shuttles, if your hotel does not appear on the list, look for the closest one, stops are not far from each other so it will not be far to walk. 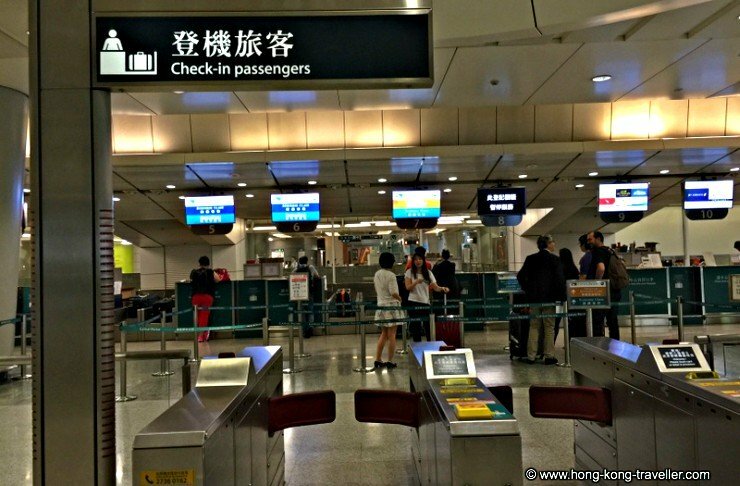 Another convenient feature of the Hong Kong Airport Express, is that on the day of your return, you can check-in for your flight in the city, at either the Kowloon or Hong Kong stations. That means, you check-in your bags in town, rather than at the airport, you also collect your boarding pass here. This is extremely convenient when you have a late flight. It gives you the whole day to explore without carrying stuff around, and then when you're ready, simply ride the train to the Airport and board your plane. Your suitcases will be at the other end when you arrive home!